It’s football season. And that means it’s chili season. You know the scene. It’s Sunday. It’s cold. And let’s be honest, it’s just more cozy to sip your favorite fall beverage from your comfy chair when your belly is happy and full. So, obviously, an alfresco dining situation is in order, and there’s nothing like a skewer that says, “I’m fresh, healthy, and colorful—snap a pic of me and then eat me up.” Not only are skewers easy on the eyes, but since they’re so simple to prepare (and clean up), you can probably sneak in a fun outdoor workout to your barbecue gathering. Sufficiently convinced that you need some skewer recipes for your weekend cookout? Here are 9 yummy skewer recipes to try. Guacamole Skewers It seems like there’s not a soul in the world who doesn’t like guacamole. Try this version, which includes zucchini, eggplant, tomato, and garlic. Vegan Satay With Peanut Sauce This combination includes veggies and tofu marinated in a Thai-style coconut sauce. The peanut and lime dipping sauce sounds good enough to drink on its own. Frozen Fruit Skewers This is the easiest way to make it seem like you spent a ton of time prepping for the party when in actuality, your 30 minutes of chopping work led to a few hours of me-time. This Thai-inspired recipe is actually three recipes in one: you get marinated turkey, Asian-style slaw, and a cashew dipping sauce that doubles as a veggie dip. Try this gluten-free, vegan barbecue loaf or this healthy take on coleslaw. 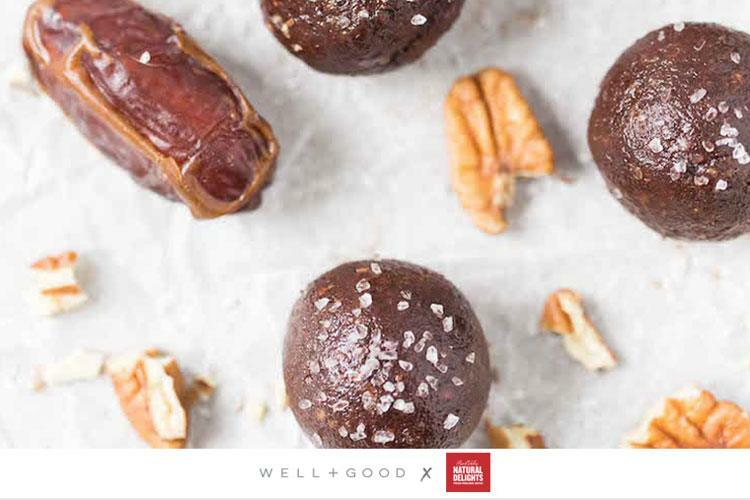 Newsflash: Super-healthy, no-bake chocolate doughnuts exist—and here’s the recipe. Are mushrooms the new avocado? Hardly—avocados will always have our hearts. They’re also the star ingredient in Laura Peill‘s raw chocolate chaga doughnut recipe. (Adaptogens help your body deal with stress, and chaga is a type of mushroom.) Raw Chocolate Chaga Coconut Doughnuts Serves 4 Ingredients 1 cup coconut meat 1/4 cup coconut flour 2 Tbsp banana flour 1 Tbsp raw cacao 1 Tbsp chaga mushroom powder 1 tsp cinnamon 1 Tbsp melted coconut oil 2 Tbsp maple syrup 2 oz. In a separate bowl, melt the chocolate and add in the coconut oil, maple syrup, sunflower butter, tahini, and coconut cream. Once the mixture reaches the right consistency, press into the doughnut pan and set in the fridge to harden. Each week we spotlight a healthy-delish recipe that’s truly genius (and easy to make) from someone who’s wowed us in the food world. Check out these spurlina-matcha doughnuts and these gluten-free rose pistachio doughnuts. 3 Reasons You Should Be Using Your Slow Cooker For Summer Recipes. I bought too many cherry tomatoes again. With a bit of vinegar stirred in at the end, this slow cooker tomato compote is magic: Good warm, room temperature or cold. Most people use a slow cooker to braise big hunks of meat in the winter. Once you understand how to use it to its best advantage, you can deploy it to cook vegetables, fruit and seafood, using a fraction of the energy of the oven and without heating up the kitchen. You can make peach compote. You can gently simmer potatoes, onions and andouille sausage in Cajun spices while you’re at work. Drop shrimp and corn in when you get home and sit down to a full-on shrimp boil 15 minutes later—find that recipe below. And, shameless plug: If you’d like more recipes like that one, consider ordering my book, Adventures in Slow Cooking, which will be out in October. The Hamilton Beach Set n' Forget Slow Cooker is programmable, has over 1,000 happy Amazon.com reviewers. Even if you don’t have a sunburn, this after-sun salve recipe is a summer necessity to re-hydrate and soothe sun-kissed skin. Apply it after a good scrub in the shower to remove sunscreen residue. Slather on this balm and your skin will drink in the oils and butters, dealing with sun-damaged skin while you sleep. Alyssa Rimmer of plant-based blog Simply Quinoa gets the busy working woman’s hustle. Her days are packed with recipe development, photo and video shoots, writing articles, and more. And considering that her day starts at 6 a.m., she gets the the whole 3 p.m. crash thing.